Hope you've all been enjoying this lovely sunshine! Today I wanted to share with you my "May Mini Haul" featuring some of the items I've purchased so far this month! I have actually been quite good this month spending wise... but there's still time! 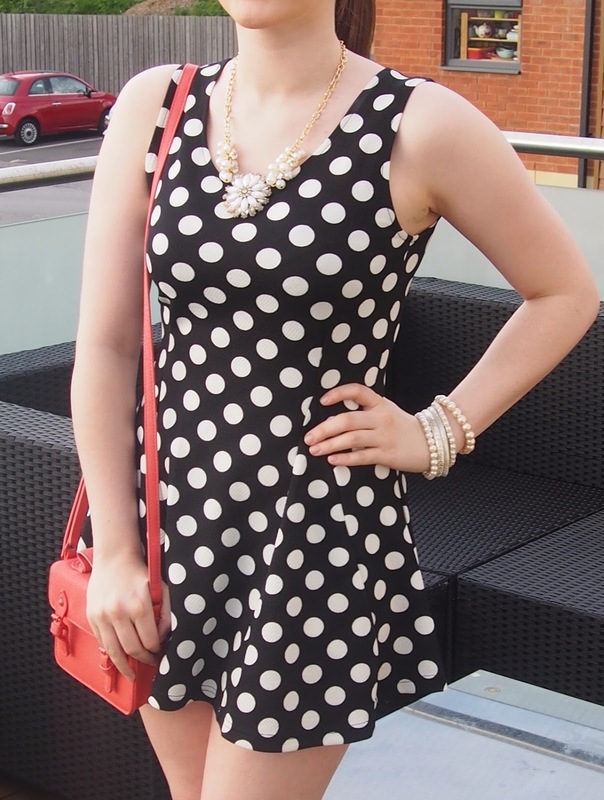 Okay first up is this ridiculously cute little polka dot dress from Newlook priced at just £12.99! I say little because it is VERY short. In fact, I'm pretty sure it's a top haha! However, when you're only just pushing 5'3 like me you can get away with these things!! It's not the sort of thing you'd wear round to Sunday dinner with the granny but I think it's perfect for a night out! Ohh and here's my face! It's actually really hard to take a selfie with braces on - you either look really angry or just a little too smug. Sorry about that! 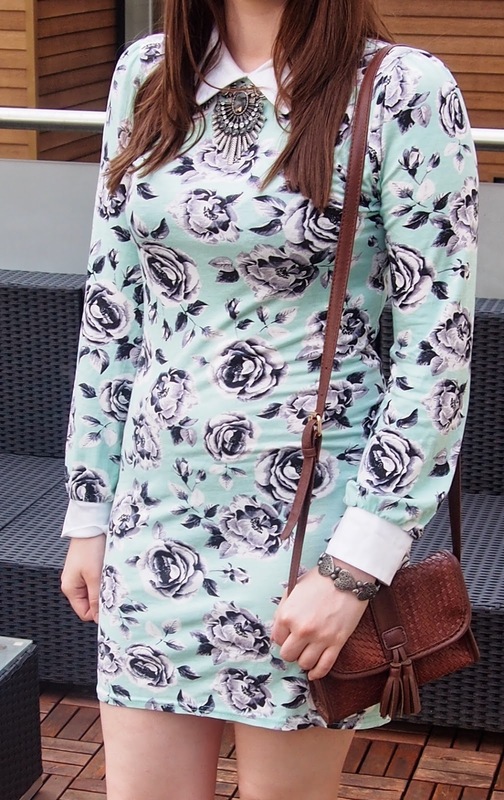 Moving on, the next item I want to share with you is this lovely floral mint dress* from Britfash! I already have a silly amount of collar dresses taking over my wardrobe however I needed one that was a little more summery and this pastel dress certainly is that! The material is really light too making it perfect for wearing in the spring-sunshine! Hurray! WARNING. Terrible photo quality alert!.....Sorry guys, but the next dress I had to share with you is this bargain of a dress from Primark! Unfortunately I haven't had time to get any decent photos of it but never mind hereeee she is! I spotted this on the lovely Eva from "xovintagewayoflife"s blog and new it had to be mine! I styled it with my trusty brown Newlook bag, some Newlook strappy wedges and a cute bow belt I got from Dorothy Perkins a while back! It also looks good layered up with a floral skirt as show below! 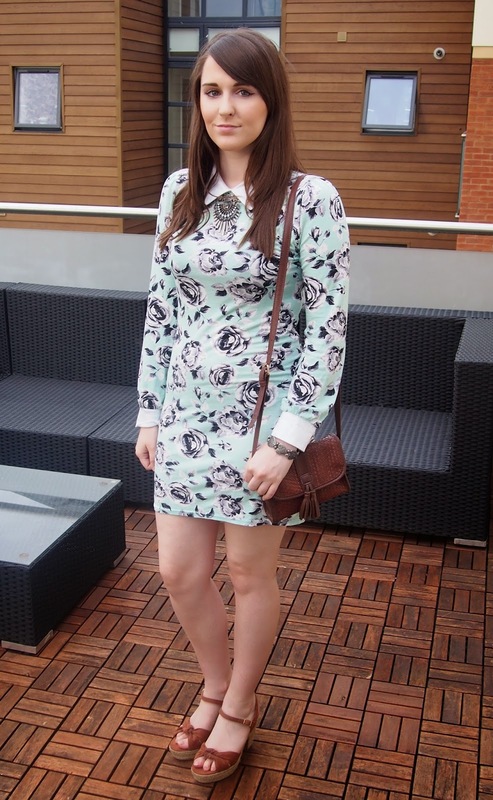 I do love a good versatile dress and for £13 you can't go wrong! Thank you Primark!! Finally, the last thing I want to share with you is in the make up department! It's the "one heck of a blot" from Soap & Glory! My good friend Lauren recently introduced me to this, after I saw how lovely her skin was looking and had to know what she was using! I have been using this for over a week now and I do think it is a very good product for warding off shine, however I don't think it's any better than the Rimmel powders which I usually use! Plus It's not cheap either at £12 a pop compared to only £3.99 for a Rimmel one! It does however come in a much better and stronger container than the cheap Rimmel ones (which I am constantly dropping and cracking!). I actually use 2 Rimmel powders - the transparent one over foundation to stop me looking orange (pale lady issues) and the silky beige one if i'm not wearing foundation to give me a bit of colour! But when I tried wearing the "one heck of a blot" without foundation it was just too pale, and since it only comes in one colour... Rimmel wins again!! Overall I do think it's a good quality powder however I would not repurchase as I am a massive cheapo and would rather not pay 3 times the amount than I usually pay! Lovely haul!! You always rock the most gorgeous dresses. I absolutely love the pastel heels as well :) Thanks for your sweet comment on my post! You look amazing, I love the floral dress!! ALL the dresses you choose were so cute! Loved each one of them. & You can't be 5'3 you look so much taller! Lol I'm 5'2 and I look it ahaha. Aw thank you Mariah!! Really glad you liked them!